during his seven week 2017 US tour. Why have we gone along with this ugly deception? 32 million Muslims have been murdered since 9/11. Meanwhile 27 million Americans have suffered avoidable death from lack of care at home. Do we accept endless war as normal? Are we numb to the suffering caused by our military interventions? Who planned, executed, and covered up the worst terrorist attack in history? 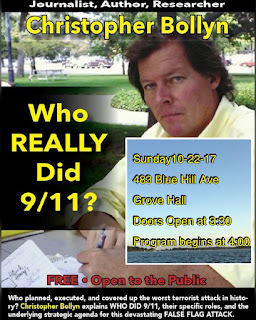 Christopher Bollyn explains WHO DID 9/11, their specific roles, and the underlying strategic agenda for this devastating FALSE FLAG ATTACK.